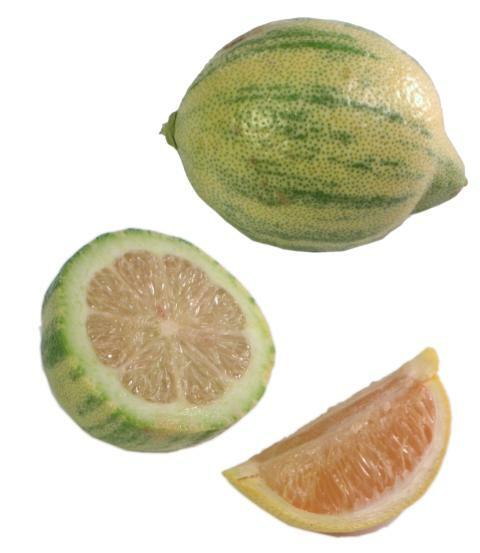 General Information: Rare Variegated Pink lemons, have green-striped skin when young and are less acidic than regular lemons when they reach maturity. This fruit is actually a mutant found on an ordinary Eureka lemon tree in Burbank, CA, around 1930. Its immature fruit has green and white stripes; the older fruit loses the stripes and develops flesh pigmented pink from lycopene, which also colors pink grapefruit. The trees are usually poor producers, perhaps because their variegated leaves are low in chlorophyll. Harvest is also difficult because these trees have thorns and widely spaced fruit. Once harvested, they taste much like regular lemons; though when mature, the flavor can be less acidic.